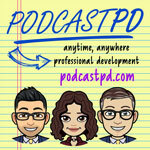 In episode 43 the PodcastPD crew talk about the ONE WORD that will guide each of them through 2019. What’s your ONE WORD? Check out My One Word to help you find your word for the coming year.